If the tenants fail to follow any of the clauses mentioned in the lease, the landlord has the right to terminate the lease early after notifying them. This would be called terminating with cause. However, what if the landlord needs to terminate the lease early? Let’s find out what and what not to do in such a case. With cause termination of lease can be carried out by the landlord too, for a number of reasons such as non-payment of rent, new occupants at your property, presence of a pet when the agreement doesn’t allow, and/or the tenant is involved in illegal activities. But, all of these are tenant related issues, while there might be situations where the landlord doesn’t find any problem with the tenants but wants the property evicted for other reasons. Such as, you urgently need money and selling the property is your only option, which is not possible while the tenant is there. Or, you or your relative want to move in to the property yourself due to some reason and need it vacated as soon as possible. No matter what is the reason, it is your property after all and you have every right to use it the way you want to. However, terminating the lease early before its due expiration period is not as easy as it sounds unless you have included a clause that allows you to end the lease whenever you need to. Such a clause is usually put by landlords who suspect that they might be selling their property soon or have to move in. This would be termed as termination without cause. The clause would state that the lease can be terminated after thirty days’ notice. Please remember that regardless if the reason is tenant related or landlord related, landlords must send their tenants a notice to evict the property with a definite deadline as determined in the lease. The average duration is 30 days. Another point to remember is that you need to include the clause in straightforward, clear-cut manner so that there is no ambiguity left and tenants don’t raise any point of argument when the time of lease termination comes. Also, make sure before signing the lease that you make your tenants understand the clauses of the lease, including the one about early termination so that they are well-aware about it before moving in. 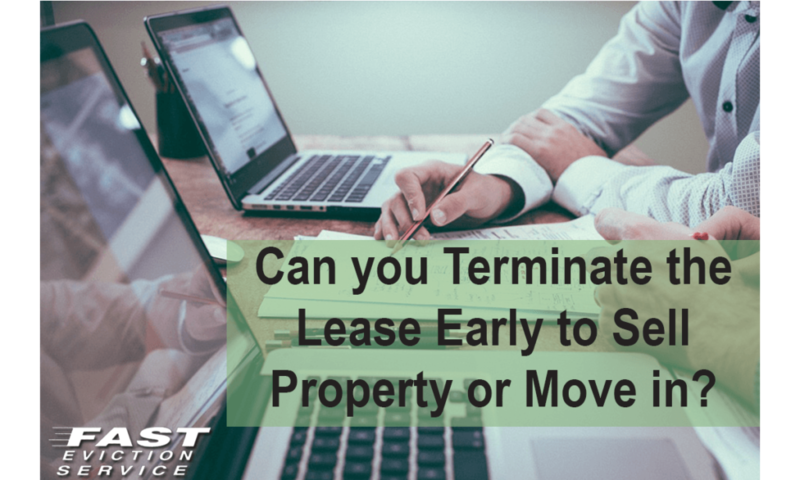 However, what if you haven’t included a clause that allows you to terminate the lease early? Usually, people don’t have the foresight to know that they might need to end the agreement earlier than expected and hence, the agreement doesn’t cover this particular issue. Absence of early termination of lease clause means that you cannot evict your tenant or force him/her to move out whether with or without cause. So, if the lease is fixed-term then it will be applicable on both the landlord and the tenant, which means that just like the tenant is required to follow the terms of the agreement similarly, landlord also has to follow it. In such a scenario, all a landlord can do is to request the tenant to move out willingly within a mutually agreed upon time period by explaining your problem or reason. There is every possibility that the tenant would listen to you and leave early. Alternately, you can offer cash to evict the property early, which might also work but the tenant cannot be forced at all to take up the offer. If they reject the offer, you have no other option but to wait for the expiration of the lease to reclaim the property. Another option that you have is to create a month-to-month agreement, which will allow you and the tenant to terminate the lease at any point. However, in this case too, a 30 days’ notice is required to be sent to the party. Some states require landlords to send 60 days’ notice or even more for termination of lease so you need to check the law in your state before sending the notice. For instance, Portland, Oregon based landlords need to give tenants 90 days’ time on a month-to-month agreement. Remember that the notifying rule is applicable on both fixed and month-to-month agreements. When Must A Landlord Pay Relocation Assistance Under Larso?